The color of gold takes on different hues based on the metallic alloy mixture or purity in each specimen. The variations are infinite because of the ability of gold to mix and alloy with other metals. Three primary metals that commonly mix together are Copper, Silver and Gold. Silver is so common that alloys with less than 80% gold are referred to as electrum. Electrum is very common as gold specimens go, high purity native gold is rare. 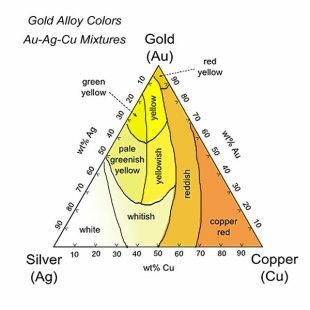 Take a look at this gold alloy mixing chart to get an idea of the color variations you can see when you perform a visual inspection of your gold. In later posts I’ll be covering other aspects of performing a visual ID of gold. Things like crystal structure, cleavage or fracture, scratch testing and mineral composition. 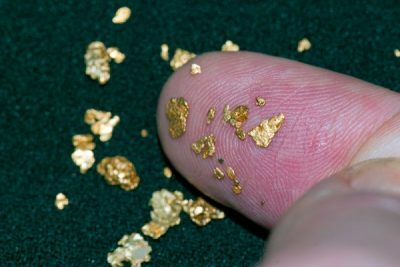 Subscribe to our newsletter to learn more about finding gold. For now lets take a quick look at gold colors of your gold samples. These gold quality indicators tell you several stories about the stuff you find while your out prospecting for gold. This chart shows zones where the gold color is varied from red-yellow to silver or copper-red. By looking closely at your gold sample you can begin to determine the %gold purity. For example if you have a nice nugget that has a slight green-yellow tone to it, That would indicate the presence of silver in a 30-50% mix, this is electrum since it’s over 20% silver. Look at the Silver %Ag axis for this. It may also have some copper too, see the %Cu axis. Cool Note: Silver and copper will oxidize or form sulfides especially in the presence of pyrites and water. Gold does not form these compounds. This will tend to remove silver and copper from the exposed surface when nuggets tumble down stream. 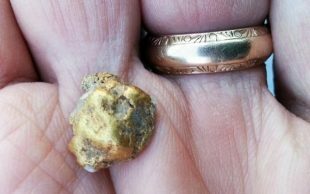 That copper silver removal naturally increases the gold concentration or purity of those gold nuggets. Gold colors in these samples tends to be richer in yellow-red color relative to the original source lode gold. High enough silver concentration will tarnish to black, copper to green.